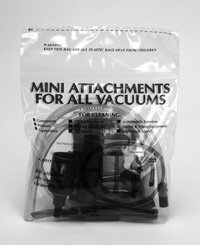 Use the micro vacuum cleaner attachments kit to provide miniaturized cleaning tools for use with your full size vacuum cleaner. Regular full size vacuum cleaner attachments are just too big and cumbersome for every cleaning task. If you’ve ever tried removing the accumulated dust from inside your car’s air-conditioning vents or from inside your computers printer or keyboard, you know how frustrating regular size vacuum cleaner tools can be to use. This 8-piece micro vacuum attachment tool kit connects to ANY household vacuum cleaner hose to provide miniature cleaning tools to safely remove equipment clogging dust and debris from all those tiny, hard-to-reach areas that accumulate unwanted dust. These tools turn your full size vacuum cleaner into a powerful micro vacuum! With your vacuum cleaner providing the power, you can use these tools to clean and remove all the dust and dirt from just about any tiny inaccessible surface…from DVR’s, model railroads, dollhouses, delicate figurines, sewing machines and sergers, camera lenses, printers, office equipment and so much more. This set includes a universal adapter and vented connector, a 36 inch long micro hose, one straight micro extension wand and a curved micro extension wand, a micro straight round bristled brush and a micro oval bristled brush and a micro crevice tool. Packed in a handy resealable poly bag package.